BOSTON (BUSINESS WIRE), January 26, 2015 – Today Sprint customers in Boston can enjoy expanded wireless service along much of their commute in the MBTA. Sprint has expanded its network coverage to include all 35 underground MBTA stations and 19.5 miles of tunnel on the Red, Blue, Green and Orange lines. The Silver Line and Back Bay Station are part of a planned future expansion. 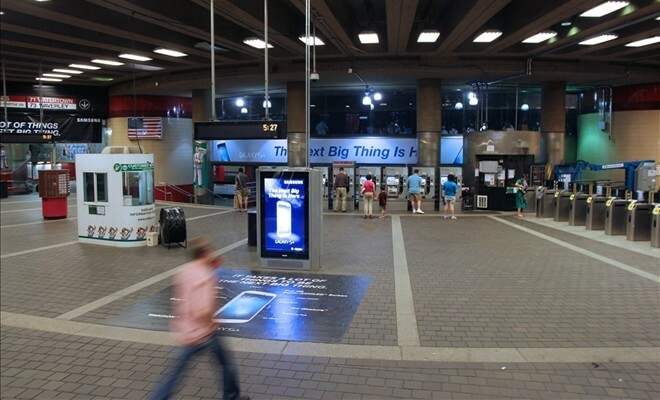 Last spring, Sprint partnered with InSite Wireless Group, a Virginia-based technology company that installed the wireless infrastructure to enable connectivity on all MBTA platforms and tunnels. According to the MBTA, the number of passenger trips topped the 37 million mark in October 2014 for the first time in the transit agency’s history. With Sprint’s new system, these passengers can now use their favorite devices to conduct business, get caught up on the day’s events, and communicate with friends and family. 4G LTE for faster, more reliable data delivering peak wireless speeds of 50-60Mbps. HD Voice, a new Sprint standard for crystal-clear voice calls providing a fuller, more natural-sounding voice on capable devices, plus noise reduction technology that virtually eliminates background noise from places like a busy road or crowded restaurant. Stronger in-building service using 800MHz low frequency spectrum. Looking ahead, Sprint will continue to invest in its Boston network by implementing new technologies and techniques to make the network more efficient and deliver improved performance and faster data speeds. Sprint (NYSE: S) is a communications services company dedicated to delivering the best value in wireless. Sprint served 55 million customers as of September 30, 2014 and is widely recognized for developing, engineering and deploying innovative technologies, including the first wireless 4G service from a national carrier in the United States; leading no-contract brands including Virgin Mobile USA, Boost Mobile, and Assurance Wireless; instant national and international push-to-talk capabilities; and a global Tier 1 Internet backbone. Sprint has been named to the Dow Jones Sustainability Index (DJSI) North America for the last four years. You can learn more and visit Sprint at www.sprint.com or www.facebook.com/sprint and www.twitter.com/sprint. 1Requires valid port from AT&T or Verizon to consumer account with $10 min. monthly rate charge. Discount does not apply to certain charges such as taxes, surcharges, add-ons, apps, premium content, int’l services, devices, partial charges or add’l lines. Usage Limitations: Other plans may receive prioritized bandwidth availability. To improve data experience for the majority of users, throughput may be limited, varied or reduced on the network. 2All lines must be ported from an active wireless line at another carrier and remain active and in good standing for at least 45 days to receive the prepaid or reward card. Register through March 15, 2015. Allow 12 weeks for your prepaid card to arrive.